It was almost a spring without incident. The Hall-Dale baseball and softball teams were days, maybe a day, from getting on their fields. And then the ominous forecast came true, and athletic director Colin Roy looked out the window and saw that winter got in one more blow. After a string of sunny, windy and mild days that brought central Maine baseball, softball and lacrosse teams to the brink of being able to hold practices and games on their fields, winter returned in the form of heavy, wet snow that began Monday, was expected to continue into Tuesday and covered those drying fields with a new white layer. There is a silver lining to the weather, as temperatures are supposed to be back in the mid-40s by Thursday and into the 50s and even 60s this weekend. Maine Principals’ Association executive director Mike Burnham said there haven’t been talks about shaking up the schedule due to Monday’s storm. The snow, however, has already had an impact. Erskine boys lacrosse saw its game Thursday against Lincoln Academy moved from its home field to Lincoln’s turf surface. The Cony boys lacrosse team, also slated to play April 11 at Brunswick, saw its game moved to April 29. Baseball and softball teams have seen the ramifications as well. Gardiner athletic director Nate Stubbert said his teams were a day of good weather away from getting on their fields, but that Monday’s snow is likely going to force them to move their home opener next Tuesday against Brewer. He added that the boys lacrosse opener on the same day against Brunswick is in similar jeopardy. 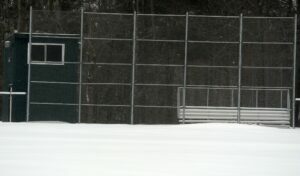 Even Roy, whose fields were close to dry a day ago, said Hall-Dale baseball and softball openers next Friday against Wiscasset are in doubt as a result of the weather. “My optimism’s a little bit tempered because of what we’ve got going here right now,” he said. Karter said most teams would likely be finding themselves in the same situation. “I think this maybe added a postponement or two for some schools,” he said. Monday had a bigger effect further north and west, where winter was harsher and more snow remained. Roy said he had spoken with Presque Isle’s Mark White and Caribou’s Dave Wakana, and that their fields were still buried. Bridgeway baseball coach Peter Kirby said his team had an exhibition game Saturday against Waterville at Colby College, and the Bandits are scheduled to play another exhibition game at Old Orchard Beach on Saturday. Bridgeway’s regular season opener, scheduled for April 22 against Hall-Dale, will likely need to be moved to Hall-Dale or a neutral site, Kirby said. Neither of the team’s home fields at Carrabec and Madison high schools will be ready. An exhibition game at Skowhegan next Monday is also in doubt, Kirby said. With no school at either Carrabec or Madison on Monday, Bridgeway players held an optional batting practice at Lacasse Bats indoor batting cage in Skowhegan. It was common practice around the area, as teams either had their practices or moved back inside, after coming tantalizingly close to being able to venture onto their fields. It isn’t, however, anything unusual. Getting on the fields before April vacation is rare, and schools have learned how to handle these changes in plans.